Matt Blumin is Associate General Counsel for the American Federation of State, County and Municipal Employees (AFSCME), AFL-CIO. AFSCME is a labor union representing 1.6 million public service workers, including the Memphis sanitation workers whom Martin Luther King, Jr. was supporting at the time of his assassination in 1968. AFSCME is the defendant in the Janus case, a right-wing attack that aims to take away the freedom of working people to join together in strong unions. Matt has worked extensively on Janus, as well as on AFSCMEs strategy for responding to its aftermath. 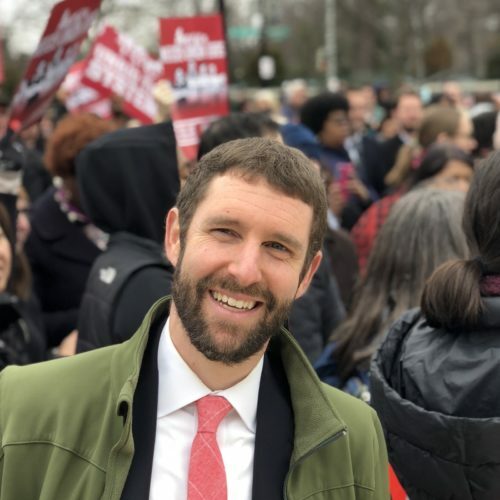 Matt’s other work at AFSCME has focused on new organizing initiatives and fighting austerity during public-sector financial crises, including by representing Detroit city employees and Puerto Rico commonwealth employees in government bankruptcy cases. On their behalf, Matt has litigated against racist predatory mortgage lending in Detroit and prison privatization in Puerto Rico. Prior to joining AFSCME, Matt worked in private practice representing labor unions and for a nonprofit legal services agency representing immigrant farmworkers. Matt graduated from Stanford Law School, after which he served as a law clerk for U. S. District Court Judge Louis H. Pollak, formerly a member of the NAACP Legal Defense and Educational Fund (LDF) team of lawyers in numerous landmark cases including Brown v. Board of Education, and U. S. Court of Appeals Judge Barrington D. Parker, Jr., a former LDF board member.